Artist rendering of Jason-3 satellite over the Amazon. The Jason-3 oceanographic satellite is planned to launch on Sunday 17th January from Vandenberg Air Force Base in California, aboard the Space-X Falcon 9 rocket. Named after the Greek hero Jason, of the Argonauts fame, Jason-3 is actually the fourth in a series of joint US-European missions to measure ocean surface height. 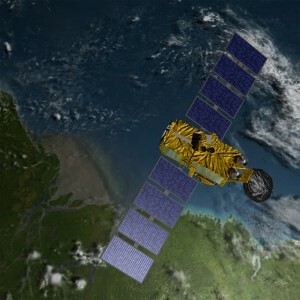 The series began with the TOPEX/Poseidon satellite launched in 1992, followed by Jason-1 and Jason-2 which were launched in 2001 and 2008 respectively. Jason-3 should provide a global map of sea surface height every ten days, which will be invaluable to scientists investigating circulation patterns and climate change. The primary instrument is the Poseidon-3B radar altimeter, which will measure the time it takes an emitted radar pulse to bounce off the ocean’s surface and return to the satellite’s sensor. Pulses will be emitted at two frequencies: 13.6 GHz in the Ku band and 5.3 GHz in the C band. These bands are used in combination due to atmospheric sensitivity, as the difference between the two frequencies helps to provide estimates of the ionospheric delay caused by the charged particles in the upper atmosphere that can time delay the return. Once the satellite has received the signal reflected back, it will be able to use its other internal location focussed instruments to provide a highly accurate measurement of sea surface height. Initially the satellite will be able to determine heights to within 3.3cm, although the long-term goal is to reduce this accuracy down to 2.5cm. In addition, the strength and shape of the return signal also allows the determination of wave height and wind speed which are used in ocean models to calculate the speed and direction of ocean currents together the amount and location of heat stored in the ocean. In addition, Jason-3 carries an Advanced Microwave radiometer (AMR) which measures altimeter signal path delay due to tropospheric water vapour. DORIS (Doppler Orbitography and Radiopositioning Integrated by Satellite) – Uses a ground network of 60 orbitography beacons around the globe to derive the satellite’s speed and therefore allowing it’s precise position in orbit to be determined to within three centimetres. Laser Retroreflector Array (LRA) – An array of mirrors that provide a target for laser tracking measurements from the ground. By analysing the round-trip time of the laser beam, the satellite’s location can be determined. Global Positioning System – Using triangulation from three GPS satellites the satellites exact position can be determined. The importance of extending the twenty-year time series of sea surface measurements cannot be underestimated, given the huge influence the ocean has on our atmosphere, weather and climate change. For example, increasing our knowledge of the variations in ocean temperature in the Pacific Ocean that result in the El Niño effect – which have caused coral bleaching, droughts, wet weather and movements in the jet stream in 2015, and are expected to continue into this year – will be hugely beneficial. This type of understanding is what Jason-3 is setting sail to discover. This entry was posted in Data, Earth Observation, NASA, Oceans, Remote Sensing, Research, Space Can Help, Space Industry, Understanding Space, Water Height Altimetry and tagged altimeter, Earth Observation, El Niño, global map, Jason 2, Jason 3, Jason-1, NASA, oceans, Poseidon, Poseidon-3B, radiometer, remote sensing, sea surface height, Topex, wave height, wave speed by Andy. Bookmark the permalink.